This trip Guy Fieri is pulling in for pork and a little tofu, too. In Sacramento, California, a pub where the chef's doing a pork sausage pizza his way - hold the cheese, hold the sauce. In Washington, DC, a Mexican-Salvadoran joint where the big seller is a Salvadoran papusa - scratch made dough stuffed with shredded pork and cheese. And in Philadelphia, a local favorite serving a vegan club sandwich with deep fried tofu and smoked coconut. I so want the recipe for the vegan tomato mayo!!!!! I would also like the recipe for those pork papusas!! My boyfriends loves them but I don't know how to make them and the ones at that restaurant looked awesome!! Where can I watch the whole episode. I missed the premier and the re-run. Sabrafamily, full episodes for this season are not yet available online. Fancast has Season 8 up now, and Hulu has a few ep's up from Season 8 too. Please post the recipe for the pupusas and the chicken tamales.Thank you. Chef Jesse should get his own show on the food network...him and Guy were funny together. 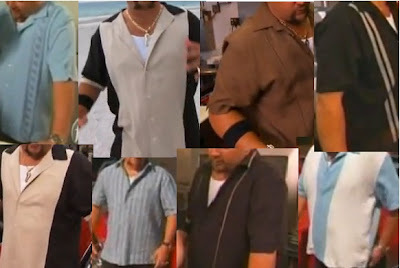 Triple D News - Like Guy Fieri's shirts on Diners, Drive-ins and Dives? Select shirts that he actually wore on the show will soon be for sale. More details here. Full interactive Diners, Drive-ins and Dives map with photos and YouTube video links at www.communitywalk.com/map/326003. Or click here to see a spreadsheet list of all Diners, Drive-ins and Dives locations, sorted by state or by zip code, updated weekly. Click here to see a spreadsheet list of all Diners, Drive-ins and Dives recipes, sorted by episode, restaurant or recipe index. Dover DE (source), Dallas TX?